Below is a list of countries that have not been matched with Vietnam. If you know a couple from any of these these country combinations, please tell them about our project. During their one week tour, the travelers, including Jon, enjoyed experiencing the lives of the Bana people. Jon was attracted by the "forest culture" and fell in love with Y Hem due to her honesty and no-thrills lifestyle. When the tour ended, Jon and Y Hem kept in touch with each other by email. To understand each other, Y Hem joined English classes, and Jon studied the Bana language by himself. Liu is from Weijian village of Linqi town, the first man in the village to take a Vietnamese wife. In 2010 when he was working in Ninh Bing of Vietnam, he met a girl amongst his fellow workers, who is now his wife. 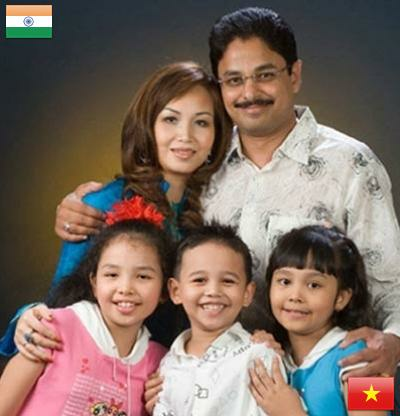 Miss Vietnam Dieu Hoa, her husband Maneesh and their three children. 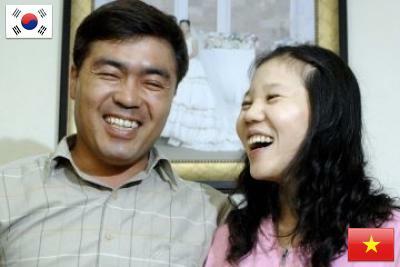 Kim a South Korean truck driver poses with his Vietnamese wife Ngo by their wedding photo after an interview at their apartment in Osan, south of Seoul.